FINALLY. Finally it seems like the heavy grey veil has been lifted off Chicago. The trees are green again. Flowers are blooming. Every neighborhood café is bustling. This is the time of year that reminds me of why we moved here. Spring has sprung and you can already feel summer coming up around the corner. This is my favorite time of year. It’s a time of anticipation and celebration and FUN. There are so so many things I’m looking forward to over the next few months. Here are five reasons I’ve been looking forward to summer 2013! I totally took these things for granted, but I grew up in the Caribbean! Can you blame me? When I migrated, I lived in Miami where the weather is either hot, insanely hot, stupid humid, or thunderstorms. I didn’t really appreciate what four seasons meant until I moved. Now that I live in Chicago – which is gray, gloomy and miserable for like 6 months of the year – it seems like the first glimmers of blue skies, sunshine and heat makes the whole city smile. The weather this past weekend made me absolutely want to skip down State Street, and if I did, I don’t think anyone would have thought I was that crazy. Alfresco dining, rooftop bars, summer nights! Without giving away too many details about exactly where I live, I’ll say this — I am a city girl who lives within walking distance to a variety of fun restaurants and bars. When the weather is right, you can feel it in the air. Downtown Chicago comes alive with customers and couples and people with strollers, just going out to get a quick bite and a drink, buy groceries to go home and grill, or to just be outside enjoy the weather while it lasts. Around the lake, everyone is happy to just walk along the waterfront and soak up the sun. In neighborhoods like Wrigleyville, the beer gardens are open and everyone’s out enjoying the sunshine and a cold drink. There’s something really cool about alfresco dining on a perfect summer night. I absolutely love it! Especially in climates where it doesn’t get too humid and there aren’t too many bugs (like Chicago). Yes! Really! This season there’s actually bathing suits that I look forward to wearing for what feels like the very first time. Monif C has an absolutely fabulous collection this season – I’m in love with her Sao Paulo high waisted bikini! And now my amazing friend Gabi Gregg a.k.a. Gabifresh has come out with her very first capsule collection of plus size bathing suits a.k.a. fatkinis. I need that purple galaxy bikini in my life, my body is ready! Gabi’s collection goes on sale tomorrow – May 15 – at SwimsuitsForAll.com. Chicago is such an awesome city for concerts in the summertime, and this year my husband and I have plan to go to quite a few! Right here in Chicago there’s Pitchfork and there’s Lollapalooza. Every year we attend Lollapalooza and I’m totally looking forward to this year – the lineup looks more diverse than in recent years and there are some acts I’m dying to see! I was so excited when I heard Pearl Jam was coming to Wrigley Field…however their attempt at circumnavigating the traditional ticket issues and scalpers turned out to be a huge FAIL. Now tickets are nearly impossible to get, and astronomically expensive to get to because of scalpers. I also really wanted to see D’Angelo at the House of Blues this August, but floor seats are pricey. I’m putting it out the universe in the hopes that some tickets land in my hot little hands. Or that someone I know has a ticket oak. Besides the aforementioned, there are some epic musical events on my radar – I’m not a house music lover but the annual Chosen Few picnic is super popular here and always attracts a crowd. And in New Orleans there’s the Essence Music Festival, which has a ridiculously sick lineup this year! I hope that I can make it. Time will tell! During the summer, each neighborhood in Chicago comes alive with festivals on the weekend. I always enjoy the neighborhood festivals, and then there are some truly unique Chicago experiences I look forward to every year. The Randolph Street Market is an outdoor celebration of antiques, gourmet food, live music, and vintage shopping – when it’s summer and a light breeze is blowing, there’s nowhere more fun to shop and wander around. I LOVE going. The Chicago Gourmet Food Festival is decadent, fabulous, over the top indulgence and it’s in the middle of Millennium Park, which makes for such a beautiful skyline backdrop. Can’t wait to go back this year! And the eagerly anticipated Taste of Chicago has stepped up the game all the way this year – there are food trucks and MAJOR concerts every night, including fun, Estelle, Robin Thicke, Maxi Priest and JILL SCOTT! I am SO THERE. There are so many more reasons I’m looking forward to this summer, but these are just a few that I’m ready for RIGHT NOW! What are you looking forward to the most? I live in L.A. and get this year round! lol Sorry. I couldn’t help it! Chicago sounds like it is loads of even if it is not as sunny and hot as my Caribbean island. Enjoy! Babygirl, I FEEL you!!! 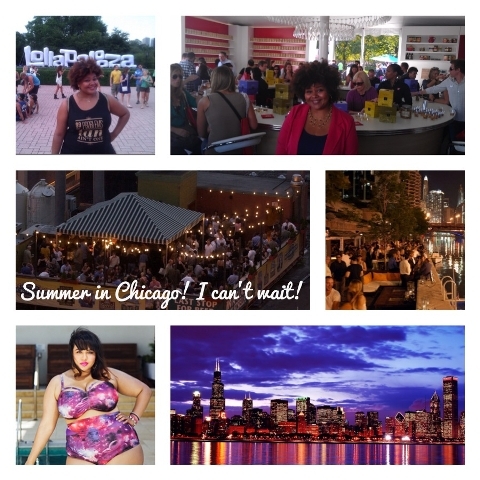 I’m a Chicagoan too, and absolutely cannot wait for all the Summertime Chi stuff to begin!! loading time is much more. Click here to see information about social bookmarking service or visit our website : submitcube. building, web based content writing for online submissions, Blogging and the like.